"It may be possible that people 'remember' things that happen when they are just embryos, a clinical psychologist argued Tuesday at a conference in Chicago. "Andrew Feldmar, a psychotherapist from Vancouver, said that he has treated three persons who repeatedly attempted suicide at about the same time each year. "He learned from their mothers that the three were doing so on the approximate anniversaries of unsuccessful attempts to abort them as embryos. "'These mothers, after 30 years of never talking to anyone about it, each admitted to trying self-abortion,' said Feldmar at a conference on psychological aspects of abortion sponsored by Loyola University. "'The month of the attempt coincided with anniversary attempts at suicide in the offspring,' he said. "While the choice to have an abortion is an individual matter, Feldmar said, women should definitely avoid unsuccessful abortions. "His patients were able to stop their attempted suicides when they realized the source of their annual depression, Feldmar said. "'They could just remember the event rather than act it out,' he said. 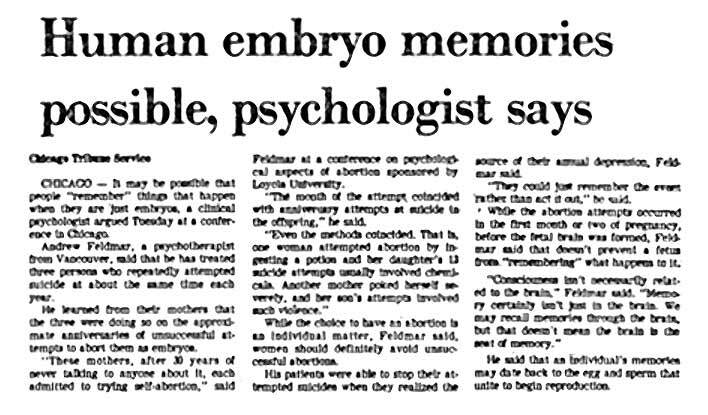 "While the abortion attempt occurred in the first month or two of pregnancy, before the fetal brain was formed, Feldmar said that doesn't prevent a fetus from 'remembering' what happens to it. "He said that an individual's memories may date back to the egg and sperm that unite to begin reproduction."